Sideways BBQ is the dream of three locals: Josh, Jeff, and Ernie. Josh started cooking barbeque with a once-a-month friends and family “throw down” about fifteen years ago and built his technique based on rubs and sauces. The restaurant developed into a family affair! Guests should look forward to seeing assorted uncles, brothers, fathers, wives, and kids involved with all aspects of the restaurant on a daily basis. The Sideways BBQ Grand Opening will feature great food, drink specials, and live music. Come out and meet the new guys! Sideways BBQ Grand Opening at the Harbor Rockwall May 24, 2018 with Owners Josh (l), Jeff and Ernie (not pictured). Josh and Jeff met during a neighborhood “friendly” corn hole competition. Their battle continues to this day – and guests shouldn’t be surprised if they have to take it outside. Will there ever be a champion?? Current score: Josh 3; Jeff 5 (according to Jeff). Cheer on or challenge your favorite at the Sideways BBQ Grand Opening! Josh entered his first barbeque competition about ten years ago and won first place! The win confirmed he was cooking something special, but it was followed by an 8th place finish at his second competition. Since then, Josh and Sideways BBQ have won numerous awards in all sorts of categories such as chicken, ribs, and brisket. That’s a long ways from the backyard! Jeff played for various MLS teams including FC Dallas from 1997-2006. After coaching for 11 years with the MLS and the U.S. Men’s National Team, Jeff and his family moved home to Rowlett and the rest is history! Sideways BBQ can’t wait to share their family-friendly environment! In addition to great food and drinks, guests can enjoy “Open Mic” nights, karaoke, local comedians and musicians. The restaurant strives to create a space for new voices to be heard. They are here to launch local Rockwall musicians! Contact Brad Jones to join the schedule, or “Like” the Facebook page to stay up to date on what music is playing now! Josh wants you to be a Barbeque Master! Check out his YouTube page where he will be posting tutorials every day. He will be teaching YOU his favorite techniques so that you can also develop an award-winning rub. Make sure to stop in at the Sideways BBQ Grand Opening to join in on the fun! Videos are already posted so don’t miss out!. 7. Did We Mention Family? Ernie and his wife Michelle (a Rockwall native!) have 8 kids! You can catch them hanging out at the restaurant in their “free” time. Ernie likes to jump behind the bar, serve guests, and help work with the food. Sideways BBQ is a place for families to enjoy themselves and enjoy The Harbor Rockwall lakeside experience. Join their family for the grand opening! Can’t wait to get in on the fun? Stop by The Harbor Rockwall to see what’s happening now! 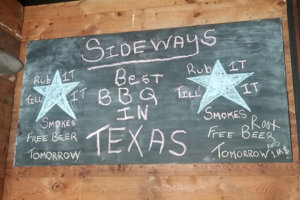 Make sure to check out the Sideways BBQ website for all the latest news, menu information, and social media connections.